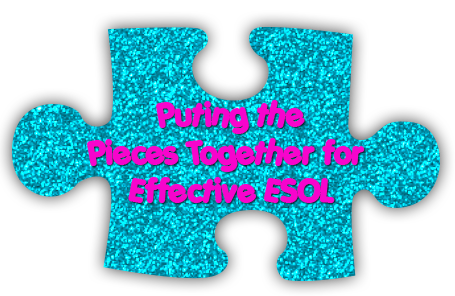 This is a continuation of the series that I started earlier this school year called, "Putting the Pieces Together for Effective ESOL". This post addresses how to work with an interpreter. Today was parent-teacher conference day in our district. Since our district has over 17,000 ESOL students, interpreters were in high demand today! Our Office of Interpreting and Translating did not have enough Spanish interpreters to cover all of the requests. Being in the central ESOL office and not having to conduct conferences of my own, I was asked to step in and interpret at one of the schools I work with. While there, I realized that many teachers do not know how to work with an interpreter! Schedule the interpreter ahead of time. Especially if you live in a district with a limited number of interpreters or a high ELL population, be sure to put your request in with the interpreter's office as soon as you know the dates of conferences. This will ensure that you will be at the top of the list to receive an interpreter. Do not assume that your ESOL teacher will schedule an interpreter unless the two of you have discussed and agreed upon this. The ultimate responsibility for scheduling the interpreter lies with the classroom teacher. Speak slowly, be succinct, and chunk your speech. I want to interpret for the parent what you are saying as quickly as possible. If you talk for 10 minutes about Hector before stopping, I'm not going to remember and be able to communicate everything that you've said. Instead, slow down, and break your thoughts or ideas down into chunks of speech no longer than 6-8 sentences at a time. Similarly, be succinct in what you want to say- limit extraneous information, communicate only the most important ideas and expound only when necessary. Look at the parent you are conversing with, not the interpreter. As the interpreter, I will be looking at you because I am listening and interpreting what you say. However, you are not talking to ME, you are talking to the parent and that is who you should be looking at. Many parents who do not speak English still feel left out after leaving a conference with the teacher because the teacher talked to the interpreter, rather than to them. Be sure to ask the parents if they have any questions. Even teachers who do this in every other conference, often forget to do this when there is an interpreter present. The interpreter is there to translate what you say, and may not add extra information or ask if the parent has questions- that is YOUR job, so do not assume that the interpreter will do it. I hope these tips for working with interpreters help you to lead successful, inclusive parent-teacher conferences!